Every year the American Humane Association's Hero Dog Awards includes a category for Military Dogs. They truly are heroes. Log on to the Hero Dog Awards website to read about this year's finalists and cast your vote for the one you think should be Military Hero Dog of the year. Memorial Day originally was established to honor Americans who gave their lives in service to our country. In recent years, it has also been a time to remember those who are currently serving in the military. 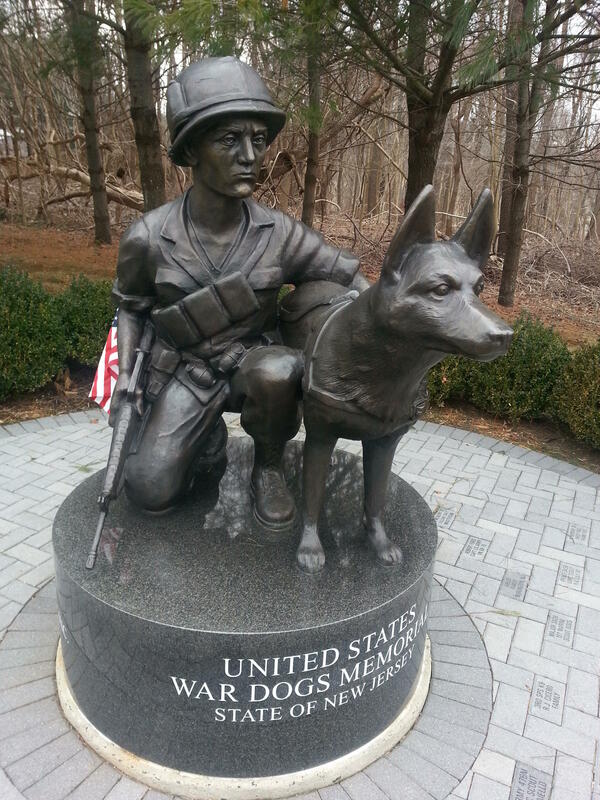 And a lot of servicemen and women would include America’s military canines among the heroes to be remembered. Often called War Dogs, the Military Working Dogs were first used by the Quartermaster Corps in World War I, but did not become officially recognized until World War II. Over the years dogs have performed a variety of services for their two-legged comrades. They have helped to track down wounded G.I.s and downed pilots. Sentry dogs have monitored perimeters on alert for intruders. Scout dogs have searched out booby traps, snipers, or enemies waiting to ambush passing troops. Today there are more than 2,500 dogs on active duty with American military forces. They still perform functions for combat, protection, and search and rescue, but their greatest talent is their ability to sniff out explosives. No matter how sophisticated a man-made device may be, it cannot out-perform a dog’s nose, which has an average accuracy rate of about 98%. There are countless members of the U.S. military, past and present, who owe their lives to a dog’s sense of smell. It might surprise you to know that not all military dogs are German Shepherds. Labrador Retrievers and Doberman Pinschers make great canine soldiers, but Basset Hounds, Beagles, even Poodles have served. The Belgian Malinois, similar to a German Shepherd, is a favorite of the Navy Seals, who find its more compact build works better for parachuting into the mission area. For more information about America’s war dogs, you can visit the website for the US War Dog Association at USWarDogs.org. You also can visit the Facebook page for Military Working Dogs. So, this year as you celebrate Memorial Day, and remember the great men and women who have served our country so valiantly, pause for a moment to remember the contribution of the faithful canine troops, when you’re speaking of pets.